A new version of Geopointe was just released and in it is the ability to perform Geo-Analytics on LOTS of data. And it’s fully integrated with Salesforce and the current Geopointe app. We have partnered with SpatialKey to bring you the Geopointe Analytics solution. The SpatialKey platform allows you to perform deep geo-analysis against massive amounts of data in a very intuitive, enjoyable and beautiful user interface. Geopointe Analytics is now available in all Geopointe trials. Existing customers may request a trial of the Analytics solution in their current system (after upgrading to the latest Geopointe version). If you are running an older version of Geopointe, you can learn about upgrading here. End-users can access the features via the Visualize tab. There, they can sync their data sets to SpatialKey, use existing org-wide data sets provided by an admin or launch into the user interface using either a full map or “blank canvas” interface. The Analytics users interface is very interactive and immersive. The following video gives you a taste of what’s offered, but the best option is to try it out for yourself. If you have any questions about this solution, contact us. These Apex methods enable Geopointe customers to utilize the proximity searching of Geopointe into advanced Apex logic. For information on all methods available to you, visit the Apex API page in the Help Center. Let’s run an example. 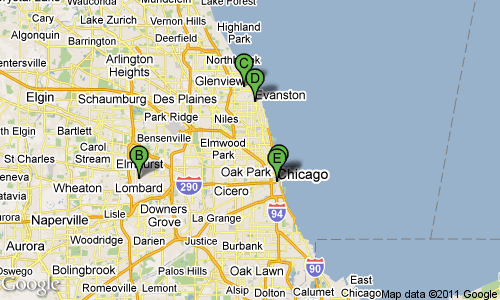 The image below displays a query (via the Geopointe UI) of our Geopointe customers within 15 miles of Wrigley Field in Chicago. We want to accomplish this same query in Apex without ever needing the UI. Now we can and the geopointe.API class will help us with this. This method allows you to perform a radial search against a Map Object (a Salesforce object enabled for mapping) and also allows the passing in of a custom filter. Here we are saying to search around the record with id a1430000001E32gAAC and to search the Account object with a filter of Type = ‘Customer’ for records within 15 miles. The method below is accomplishing the same thing, but is using a pre-defined dataset that already has the filter for Customers built into it. Both methods result in a geopointe.API.radialSearchResult object, which is defined in the Geopointe Help Center. This object will return the record Ids closest to the center as well as the distances to these locations. Geopointe includes a Visualforce Component that allows you to create Static Maps on your Visualforce Pages. A Static Map results in an image file (png, jpg or gif) that you can configure and place on your Visualforce Pages or embedded in Page Layouts. The nice thing about Static Maps is that they do not slow down your pages from loading. Rather, you are using the component to intelligently build an image URL. 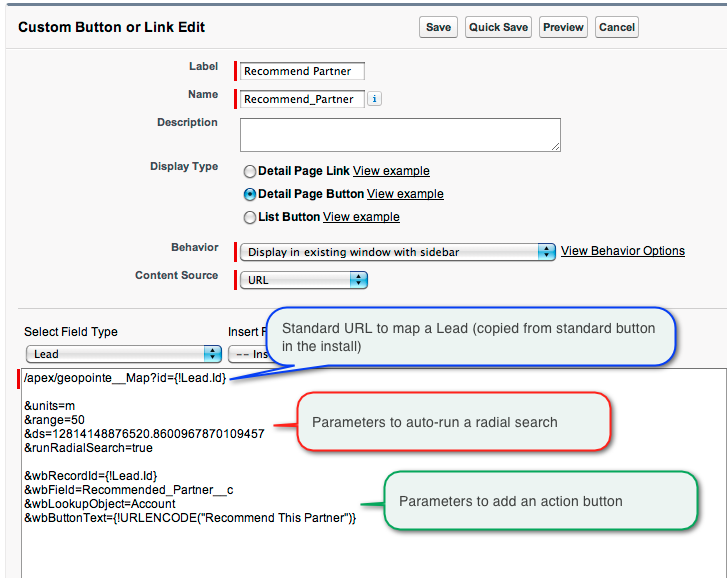 Geopointe comes with some examples with the “embeddedMap…” pages. 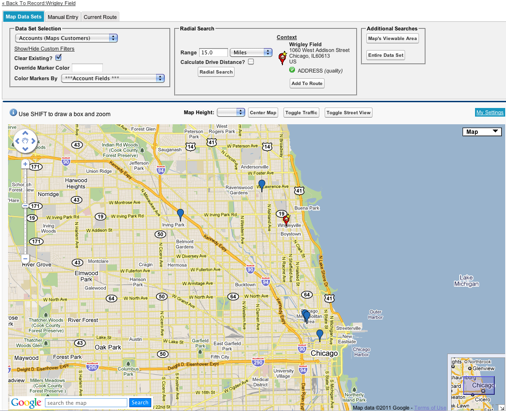 These are pre-configured Visualforce Pages using the static map component to show you the location of a record. We added a Static Map page on the website to act as the official documentation home for this functionality. With Geopointe installed, you also get a documentation in your Component Reference regarding the geopointe:staticMap component. Below are some examples showing off the functionality. Want to help with Info Center? I’d like an independent developer to “co-own” the Info Center app with Arrowpointe. This dev will help take it to the next level. This dev will do this in the name of getting some exposure for themselves and also as a way to learn force.com technologies. The result is a publicly facing deliverable. Info Center will remain free. The dev should consider this a side project (i.e. no pay) done in the interest of proving an app to the community and learning some things along the way. If you are a developer and have wanted to get out there and do something on AppExchange, this is a good opportunity to get some experience for very little risk (you are only spending time). Info Center is an app I created back in 2006. To use it, an admin works in objects called Messages, FAQs and Links adding data for the purpose of communicating it to end users. It was originally created for consulting projects I worked on as a place where the admin could answer FAQs for users as the deployment took off. End users are given the “Info Center” tab, which renders all this data for them in a nice, easy to read format. It has not changed in function or technology since 2006 and it could use an update. For example, the Info Center tab below currently uses a S-Control to render it. My focus is now on Geopointe and I have no time to work on Info Center. I’ve been meaning to update it for a while now, but never got around to it. Therefore, I wanted to see if anyone in the community (ideally an independent developer) wants to take on Info Center 2.0 and we’ll see what comes of it. It still gets 10-20 installs per month and will provide a good way for someone trying to “make it” in the force.com world to gain some credibility. May as well help with an app that has a bit of momentum already, right? Info Center was a project I assigned myself in 2006 in order to learn s-Controls and the API. Having my deliverable be public facing went a long way towards making it polished, teaching me about the AppExchange and the nuances of delivering a app for others to use. I’d like to pass that experience along to someone else. There is no timeline for this. I am first looking for the right person who’d like to take this on. If it takes months to complete, that’s fine. As long as the person is committed to the task at hand. 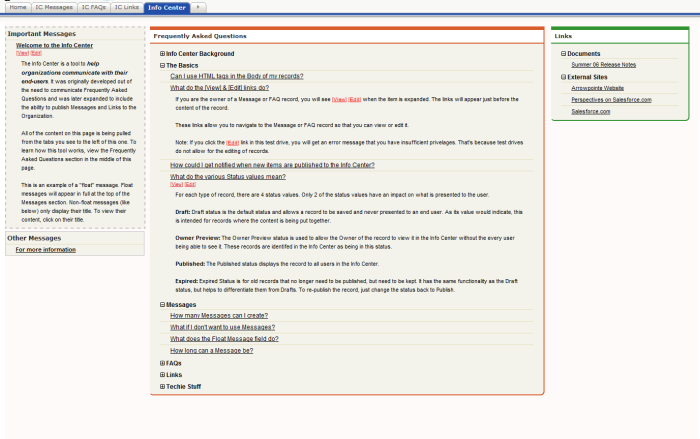 At its simplest, I’d at least like to have the Info Center tab render using Visualforce. I could envision a mix of Visualforce, Apex and jQuery being the technologies used. If delivering these technologies in an AppExchange app appeals to you, consider taking this on. If interested, comment on this post and we’ll take it from there. Please only comment if you are genuinely interested and feel you’d be able to see it through to the finish. If you want to contact me privately, you can do so here.